The right to perform Mudiyettu is hereditary and now in Kerala there are only three or four Maarar families continuing the tradition of performing this ritual art. Sankarankutty Maarar Smaaraka Mudiyettu Sangham, Keezhillam, is one among them. 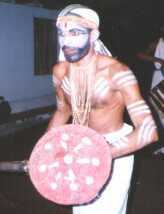 Late Sankarankutty Maarar's elder son Keezhillam Gopalakrishna Maarar is the chief co-ordinator of the troupe and the younger son Keezhillam Unnikrishna Maarar performs the main role of Kaali.